Shetland’s yearly events start with the fire festivals which mark the end of the long winter nights. Shetland Folk Festival and Fiddle Frenzy are a celebration of Shetland’s outstanding musical heritage. Screenplay, Shetland’s film festival, brings movie stars to the islands, Shetland Wool Week showcases Shetland’s sheep and textile industry and the Simmer Dim Motorcycle Rally is a celebration of the long summer nights. It’s easy to see why this fantastic range of festivals draw people back to Shetland again and again! In other island communities, January, February and March are the quietest months of the year, but this is not so in Shetland. The last Tuesday of January is when one of the biggest events of the year takes place – Up Helly Aa! Around 1,000 guizers, led by the Jarl and his squad, take part in a spectacular torchlit procession around the streets of Lerwick, before setting alight a purpose-built Viking galley. Should you miss Lerwick Up Helly Aa, there are other fire festivals which take place throughout Shetland during January, February and March. Taking place in the Garrison Theatre in Lerwick, the Shetland County Drama Festival sees drama groups from different areas of Shetland perform a play, all vying for first place in the competition. Genres can be varied – a comedy may play alongside a drama – but each night is thoroughly entertaining. For each drama group, awaiting the adjudicator’s decision at the end in a dramatic moment in itself! One of Shetland’s fiercest fought competitions, this is open to fiddle players aged 16 or under. The competition takes place over two days, with the final decision made at the prize-giving concert on Saturday evening. The overall winner is hailed as “The Shetland Young Fiddler of the Year” – and previous winners read like a who’s who of fiddle excellence. 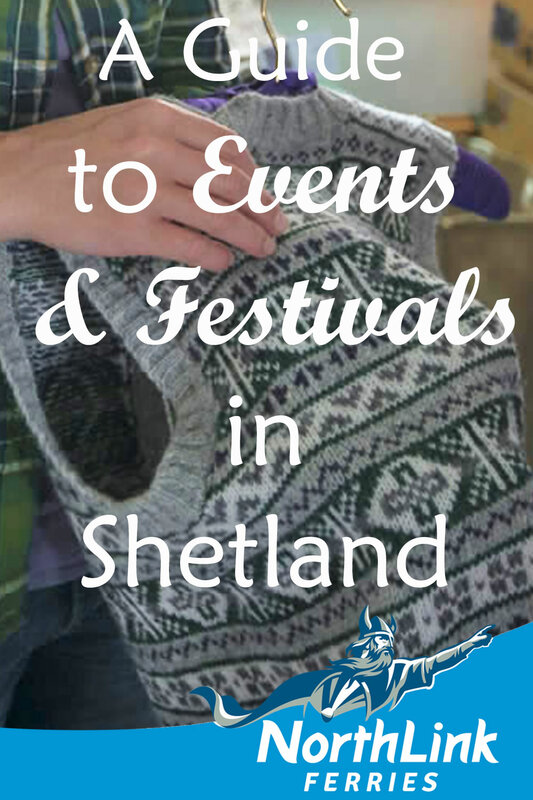 One of Shetland’s biggest events (that doesn’t involve fire!) is the Shetland Folk Festival. The incredible roster of artists includes some of the best local and visiting musicians there are, performing at venues throughout the isles. Begin the fun on board the Aberdeen to Shetland ferry during the unofficial opening in the middle of the North Sea! The Lerwick Lifeboat Open Day takes place every year at Victoria Pier with tents, stalls, homebakes and a BBQ to raise funds for the RNLI’s Lerwick Lifeboat – the Michael and Jane Vernon. Each year NorthLink assist with the fundraising by organising a cruise around Bressay, which often involves a demonstration from the Lifeboat and the Coastguard helicopter. The annual Mid-Summer Carnival in Lerwick involves a fancy dress parade through the streets (ending up on Victoria Pier) with topical floats and even Shetland ponies! It’s a great evening of fun with a super atmosphere, which raises money for good causes. The most northerly motorcycle rally in the UK attracts around 300 bikers from far and wide to enjoy midsummer in Shetland. The Simmer Dim Rally is famous for its superb atmosphere – and entry is by invite – see the Simmer Dim Facebook page for more details. Motorbikes are welcome with NorthLink Ferries – we expect a car deck full of bikes in the days before the event! An Annual North Sea yachting challenge, taking place between Bergen in Norway and Lerwick, Shetland which attracts between 40 to 60 competing yachts! The Shetland Nature Festival has a full programme of events including guided tours, talks and family fun days which celebrate the seabirds, sealife, wildflowers and geology of Shetland. Coinciding with the school holidays; families are encouraged to come along to discover wildlife together – the activities throughout the islands are designed to suit all ages and abilities. UnstFest is a week of fun events on the lovely island of Unst. Activities from previous years have included: Cooking for bairns, Rollerwheels (skates, scooters and bikes at the leisure centre), a Teddy Bear Hospital where you can get your best pal mended, Fire Station open night, a Stone Skimming Championship, a guided walk to Hermaness and the UnstFest Summer Carnival. A bi-annual celebration of world-class fiddle music from Shetland, Fiddle Frenzy is part traditional fiddle school (during the day) and part fiddle festival (during the nightly concerts). Come along to learn the tunes and secrets of the unique Shetland Fiddle style. There are also workshops on guitar accompaniment, knitting, drawing, painting, and writing run by experienced tutors. A great day out for young and old are the Shetland Agricultural Shows in August / September. Unlike Orkney, where there’s a show week, in Shetland the shows are distributed evenly throughout the month. All are great days out, with plenty for children to do and competitions for the best livestock and produce including veggies, baking, knitting and crafts. Shetland Boat Week offers a brilliant range of maritime activities to enjoy over the course of a week. These include talks about the history of fishing and shipwrecks in Shetland, boat trips and demonstrations of traditional skills. During Shetland Boat Week, NorthLink will offer bridge visits, giving visitors the chance to see behind the scenes! Mind your Head is a Shetland charity formed to promote mental health positively. The annual Mind Your Head Fun Run and Walk, held at Cunningsburgh, is a friendly event which raises funds for this worthy cause! Shetland’s annual Film Festival is curated by film historian Linda Ruth Williams and film critic Mark Kermode. It features a feast of film screenings, lectures and panel discussions. Every year in Autumn, the festival attracts figureheads of the British Film Industry to Shetland – from film-makers to movie stars (Jim Broadbent and Mark Kermode are pictured above)! Screenplay also has a strong local flavour and celebrates the work of local filmmakers. It is perhaps fitting that Shetland Wool Week occurs at the time of year you start to think about looking out your woollen jumpers! This popular and fun festival is a celebration of Britain’s most northerly native sheep and the craft producers that make the most of the surrounding resources. Events include exhibitions, open studio tours, and master classes with well-known local and international knitters and designers. Visit the website to download a free knitting pattern! The Taste of Shetland Festival is a celebration of Shetland’s delicious larder and there’s plenty to experience in the Clickimin Leisure Centre, Lerwick; including stalls, cookery demonstrations and samples to tempt your tastebuds! The annual Shetland Accordion and Fiddle Festival brings together the best of traditional music from Shetland, Scotland and beyond for a weekend of concerts, suppers and dances. The festival culminates with a grand dance where around 12 bands provide the music for around 1000 dancers at Lerwick’s Clickimin Leisure Complex. Shetland’s book festival welcomes writers of local, national and international renown and features a mix of readings, writing workshops, and book signings. The Book Festival offers a unique opportunity for readers to meet with their favourite author and hear them read their work. It takes place in the winter – the perfect time to curl up in front of the fire with a book! One of the Scotland’s premier motoring events – the Shetland Classic Motor Show takes place every two years – and the next one will take place in 2020. The sight of vintage cars and motorcycles around the isles will be a lovely one – hundreds of classic cars, motorcycles, and military vehicles will visit Shetland for the event.